Back o the Beck in Skipton, Yorkshire sleeps 2 people. 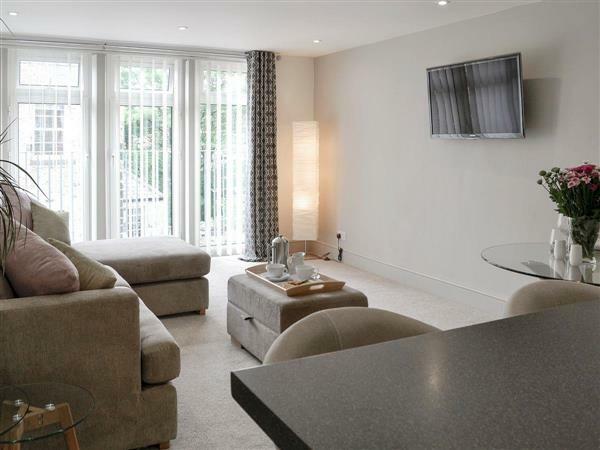 Back o’ the Beck in Skipton has been carefully furnished and equipped; this ground floor apartment forms the lower half of the owner’s own home and is set just a short stroll from Skipton’s broad, cobbled High Street. A Norman castle stands proudly at the head of this bustling market town which offers a wide selection of shops, pubs and restaurants. Whilst centrally located, it is ideal for walking direct from the door, with picturesque walks found in nearby Skipton Woods, or over Sharp Haw which provides more demanding walking. Alternatively, the spa town of Harrogate is just a 20-minute drive and will satisfy the most ardent shopaholics, and a little further afield lies the historic city of York, also accessible by train in an hour via Leeds. Skipton is the gateway to the Yorkshire Dales National Park, and is a much sought-after destination for walking, touring and biking in stunning scenery - the apartment offers lockable bike storage. The shop, pub and restaurant are 50 yards from Back o the Beck in Skipton. Ground Floor: Back o the Beck in Skipton is all on the ground floor. Living area: With 40 Smart TV with Netflix and French doors. Bedroom: With king-size bed and Freeview TV. Gas central heating, electricity, bed linen, towels and Wi-Fi included. Bike store. On road parking, free 6pm to 9am and 1 for hour between 9am and 5am; additional public car park, at an additional charge, 300 yards. No smoking. For a better idea of where Back o the Beck is, you can see Back o the Beck on the map below. Back o the Beck is in North Yorkshire; should you be on the lookout for a special offer, you can find all the special offers in North Yorkshire. It's always worth checking to see what is on offer at the moment. Do you want to holiday near Back o the Beck (UK2298), you can see other cottages within 25 miles of Back o the Beck; have a look to find your perfect holiday location.